Education leaders in Minnesota have the opportunity to access a national perspective around the vital issue of gifted and talented education and meeting the unique needs of these students. 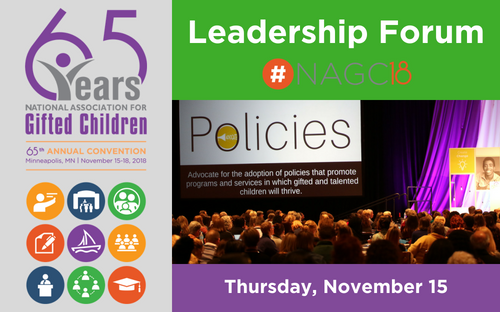 On the opening day of the NAGC 65th Annual Convention, November 15, a high-level Leadership Forum and luncheon will be held at the Hilton Hotel. This invitation only event is extended to superintendents and a member of their administration or school board. Here is a draft agenda for review. The Leadership Forum Invitation and RSVP link will be emailed in early September to invited education leaders. Should you have questions or need more information, please call NAGC at 202-785-4268.